This new apartment/townhouse is one of 24 in the exclusive Pedra Grande condominium complex, just 45 minutes from Faro airport. 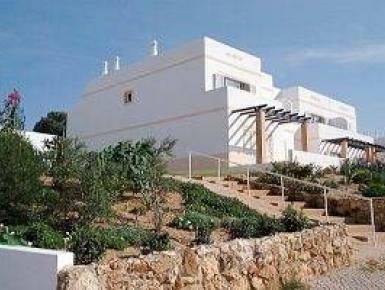 It is an 8 minute walk to Vale de Centeanes beach and the same to the challenging par 3 Vale de Milho golf course. Groceries, tennis and gym are just minutes away in the adjacent Rocha Brava compex using the private Pedra Grande entrance. The apartment has four balconies and a large roof top terrace with barbecue. It is fully furnished and the kitchen has five appliances and a microwave. There are two bedrooms (queen and twin), two full bathrooms (main and an ensuite in the queen bedroom) and a spacious living/dining room with fireplace,Sky digital TV, DVD player and free WIFI.